As many know, today’s Conservation Corps owe their ethic of service to the Civilian Conservation Corps (CCC), which operated across the US from the years 1933 to 1942. 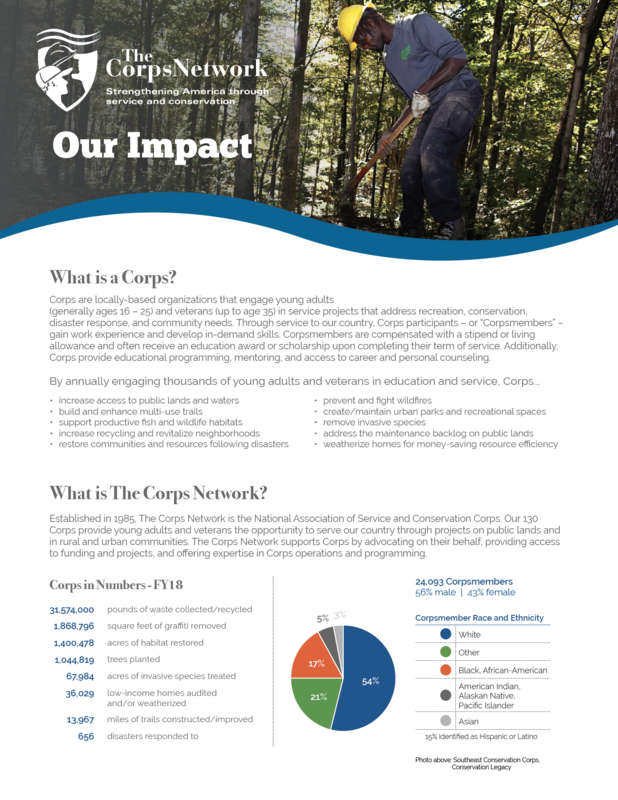 The state of Oregon – home to several members of The Corps Network, including Northwest Youth Corps (NYC), Heart of Oregon Corps, and three Job Corps Centers – hosted 61 CCC camps. These camps enrolled nearly 25,000 Junior and Veteran CCC members; 2,750 Native Americans; and 6,800 other participants. One of these camps was at Silver Creek Falls, located east of Salem, and now Oregon’s largest state park. In recent years, NYC crews have worked at Silver Falls State Park to help rebuild and re-roof cabins originally constructed by the Works Progress Administration (WPA) and the CCC, as well as complete other projects, such as reroofing the lodge. More information can be found here: http://www.ccclegacy.org/Northwest_Youth_Corps.php. 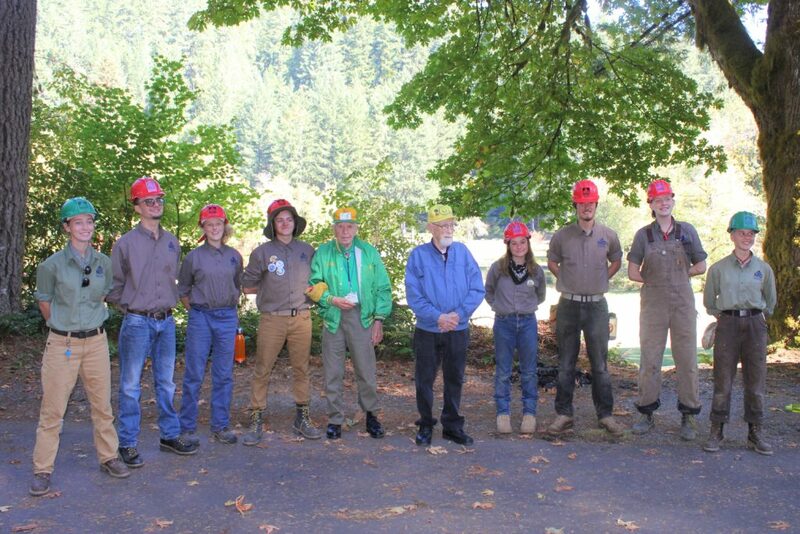 Over the weekend of September 29 – September 30, Silver Falls was the site of the CCC Legacy Annual Gathering. Co-hosted by Northwest Youth Corps, this year’s event celebrated the 85th anniversary of the CCC. Attendees included more than two dozen guests, as well as a few members of the original CCC. Activities included a kick-off social attended by 10 authors who have written about the era, as well as the CCC alumni – also known as the “CCC Boys.” Beside a tabletop display of “traditional” hand tools surely familiar to CCC members, and still in use by NYC and other crews today, NYC Development Officer Natalie Whitson and NYC Program Coordinator Edison Velez both spoke about how members of The Corps Network carry forth the ethic of service started by the CCC. 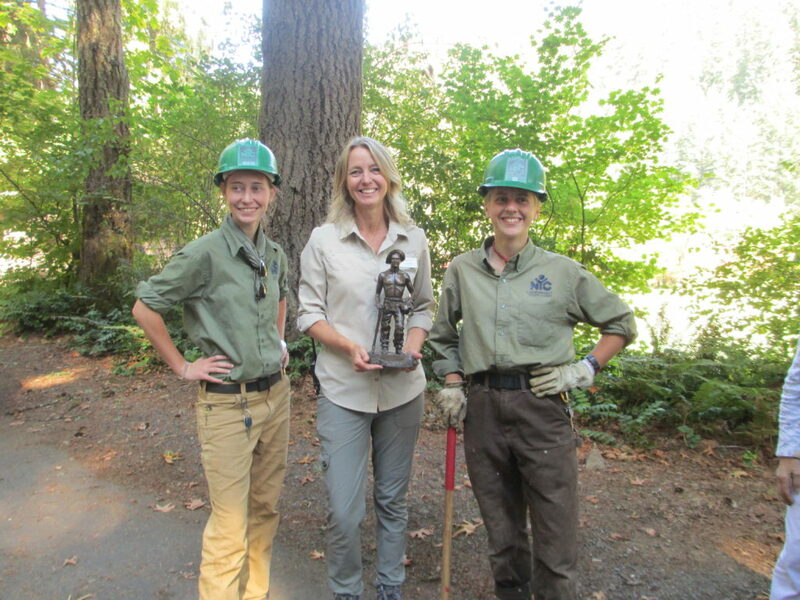 The next morning, a NYC crew and NYC staff joined CCC Legacy during their trip to Silver Falls State Park. During the morning activities, hosted by Brad Chandler of Oregon Parks and Recreation Department, NYC Corpsmembers helped beautify the grounds, prior to eating lunch with the CCC Boys and CCC Legacy. NYC Director Jeff Parker welcomed the group and acknowledged the work of the original CCC. He spoke of the ‘30s era historic preservation techniques and tools that NYC members had to use during reconstruction at the Park, due to Silver Falls’ properties being listed in the National Register of Historic Places. Jeff also read the text of a Governor’s proclamation naming September 29, 2018 as Oregon CCC Day. For their service, NYC Corpsmembers received a specially-designed CCC patch, while Jeff and Natalie received special certificates for their service. After lunch and taking photos with the NYC crew, CCC Legacy’s guests then traveled to the Forest History Center, Forest Office Headquarters, where they toured and laid a wreath at the CCC Worker Statue. CCC Legacy also toured CCC buildings at the Zigzag Ranger Station with Ranger Bill Westbrook, and toured the CCC museum at the Mt. Hood Cultural Center. Guests also visited Timberline Lodge, built by the WPA from 1936 to 1938 and furnished by local artisans of the era. CCC Legacy’s guests learned about the CCC Art Program, a unique group of artists sent into CCC camps with President Roosevelt’s personal approval, who chronicled America’s greatest conservation movement. Some of the art produced was contributed by Art Clough, who – with his two assistants – created six huge wood carved panels and 18 smaller panels illustrating the work of CCC enrollees in the forests of Oregon. These panels now permanently reside at the University of Oregon, in Eugene. More than mere artifacts of wood and stone, however, the lasting legacy of the CCC is service. The men of the CCC were so convinced of the goodness they derived from their CCC experience that they firmly believed that everyone should have a public service experience. When they were younger, some of the CCC Boys would come to The Corps Network Forums, and they loved it. In that same spirit, NYC salutes the work of Naomi Shaw, Secretary of CCC Legacy and Chair of the Annual Gathering Committee; Joan Sharpe, President of CCC Legacy; and all the board members of CCC Legacy who worked tirelessly to organize this celebration, and who work year-round to represent the CCC alumni of America, bring awareness to the heritage of the CCC, and offer support to the modern Corps who carry on the work of preservation, education and conservation.